A war-game about the Middle East. Background: A war has raged in the middle-east my entire life, I´m born in 1953. A war about land, water, media and world-opinion. A war waged with help from the worlds super-powers. Murder, snipers and “removal” of hostile persons. We have seen and heard so much, that we see and hear no more. This finger-toy is about the war in the middle east. A war that keeps waging, no matter the media coverage or how involved our politicians gets. In December 08 there was a major attack on Gaza, with enormous civilian suffering and death. “Somebody” chose “attack” in the war-game of reality, and what was the result? 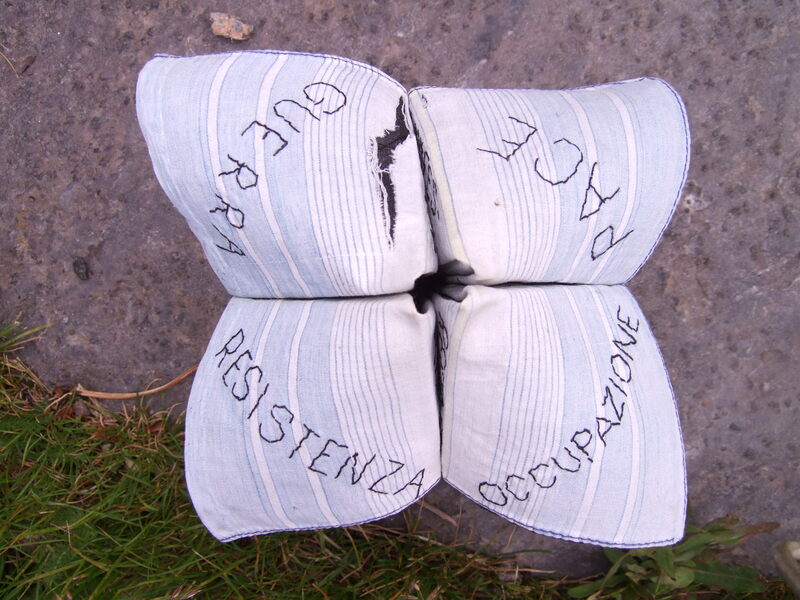 A large handkerchief embroidered in Italian, starched and folded into a finger-toy. To play with it takes two people. The person who is handling the toy place thumb and index finger of each hand into the toy. The other person makes the choices. The first step of playing the game is to choose between war, peace, occupation and resistance. The word is spelled into the toy, with each letter the toy is moved with either the thumbs and index fingers separating or the fingers on each hand separating. This limits the choises in the next stage, where you chose the kind of action you want to take, to reach the goal of your first choice, that is spelled out too. Then you chose one of the numbers (the dots at the root of the toy) and open to see the result of your choice. The lack of compliance between form of action and the result is unfortunately closer to reality than expected.